A Metadata is a data that qualifies another data. For example, if you have a digital camera, I guess you have now a lot of photo sitting on your pc. Chances are you are going to have trouble finding them if you have not organized them the right way at the beginning. Recent photo handling/organizing software like digikam, kphotoalbum, or Picasa features keywords. You can add keywords to your photo so you can search by keyword later for example. In this example, keywords are metadatas, it is a data that qualifies a photo. In Wiclear, metadatas are datas that qualifies a particular page. The WikiBlog plugin uses metadatas to add a "category" metadata to the content. This way it is possible to browse the site by metadata using the WikiBlog plugin. Metadatas in Wiclear are quite general so I guess we are going to see things important with them in the future. Right now I must say their use is quite anecdotic : there is currently nothing using them apart to display them (and except the WikiBlog plugin). Use the metadata link available in the tool box. This will display current metatas as well as a form to edit them. In Wiclear metadatas must be defined by the admin which give them a name and a type. 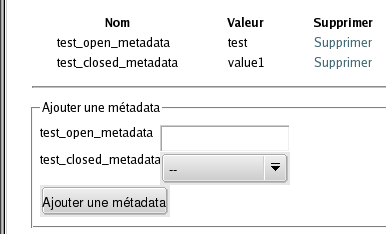 There is no limit to the number of metadatas that can be added : you can define several time the same metadata with different values. For example, the WikiBlog plugin defines a "category" closed metadata and offers an interface in the admin panel to edit the available values. Of course, you could use the more general metadata entry in the admin panel to do the same thing, except that the WikiBlog interface is more user friendly.